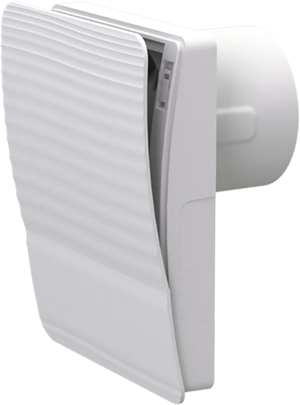 Innovative extract fan with stylish design for enhanced comfort level in shower rooms, bathrooms, kitchens and other residential premises. 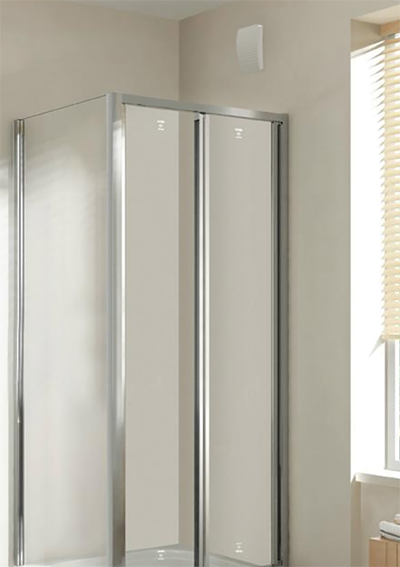 Intermittent or continuous ventilation of bathrooms, shower rooms, kitchens and other utility spaces. The casing and the impeller are made of high-quality and durable UV-resistant plastic. 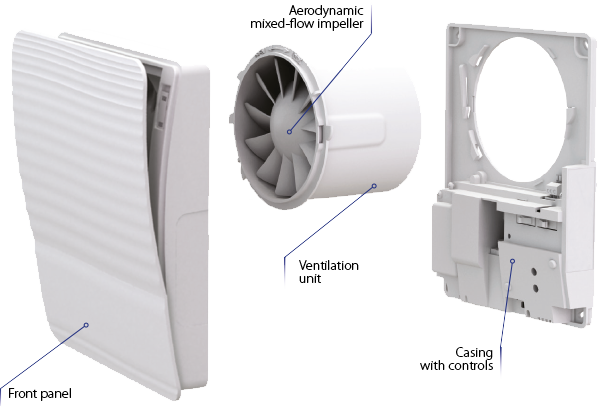 Due to its modern look the fan is compatible with any interior design. A shortened spigot for mounting into a ventilation shaft or direct connection to Ø 100 mm air duct. 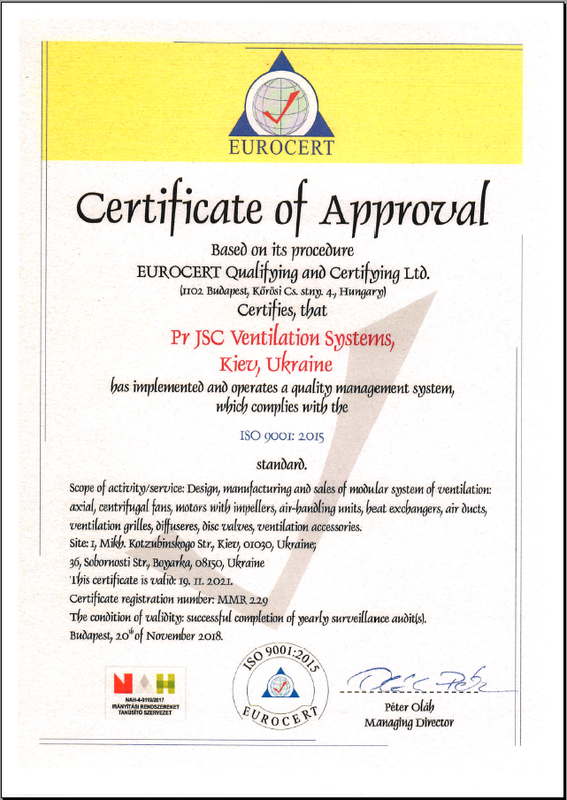 High ingress protection rating makes the fan the ideal bathroom ventilation solution. The electronic components are protected with tight covers. The integrated thermal actuator enables smooth opening and closing of the front panel to prevent backdrafting. The motor is equipped with a new energy efficient two-speed ball bearing motor with low energy demand. Motor equipped with electric overheating protection. Operation mode 1: the fan is turned off by default. The fan switches to the low speed when the switch is closed or to the high speed when the humidity sensor is activated. Operation mode 2: the fan is turned off by default. The fan switches to the high speed when the switch is closed or the sensor is activated. By the timer T: the integrated regulated turn-on delay timer activates the fan one minute after the light switching. After the fan is turned off with the external switch, the fan keeps running within 2 up to 30 minutes according to the settings of the turn-off delay timer. The interval timer activates the fan each 6, 12 or 24 hours for a short time period during a long standstill. By the humidity sensor and timer ТН: if the humidity level in the room exceeds the set point adjustable within 60 to 90 %, the fan turns automatically on and operates according to the timer settings, from 2 to 30 minutes. VENTS 100 Style Duo T Modification with a turn-on delay timer regulated from 10 seconds to 2 minutes, a turn-off delay timer regulated from 2 to 30 minutes and an interval timer (activation of the fan each 0, 6, 12 or 24 hours). VENTS 100 Style Duo TH Modification with a turn-off delay timer regulated from 2 up to 30 minutes and a humidity sensor regulated from 60 % up to 90 %.